In this video interview series I got a chance to meet Matt Diggity from DiggityMarketing. We met in Bangkok at Affiliate World Asia and discuss great things about SEO. He is famous for his PBN links. 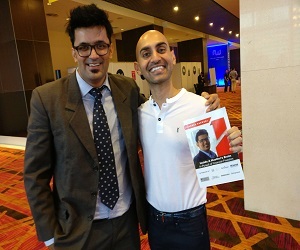 I took his interview & he shared valuable knowledge about link building & PBN. He is a travel addict. He was born in the United States and lived there for many years, but as soon as he got the green light, he purchased a one-way ticket to the rest of the world. He is currently located in Chiang Mai, Thailand but He had also lived in Costa Rica, Japan, and Bali. He had traveled to over 35 countries across the globe, but he normally gravitate to Asia as he really connect with the culture here. Chiang Mai in particular affords an incredibly laid back lifestyle, but at the same time, some of the world’s most successful digital entrepreneurs gravitate here. There’s a huge community of people killing it online. He put a high value on balancing work and social life. II can say that he is incredible human being with lot of SEO knowledge. Private Blog Networks Guide: Are PBN Backlinks Worth It 2019 ? It is really very informative video and I think you have also enjoyed a lot with Matt. From this interview – we can learn many things and this conversation is going to help many people to maximize their productivity level. Eventually, thanks for sharing. Glad to read your informative post and I totally agree with your points. We are very very familier and know that backlinks are the backbone support of our website. Without backlink, website cannot stand on the top when it comes to subject of google whether they have good content or good visual nothing matters. Most important about LinksManagement it comes in resonable price and having a modern approach to understand your crucial needs and helps to understand website management more clearly. Thanks for revealing a light on this topic. Really Nice Stuff , I learned Lot of Things From Bloggers ideas. Very nice article and very informative video. keep up the good work. I will share this article to all my friends. This article is very informative. awesome amazing post i m really glad to read this post..